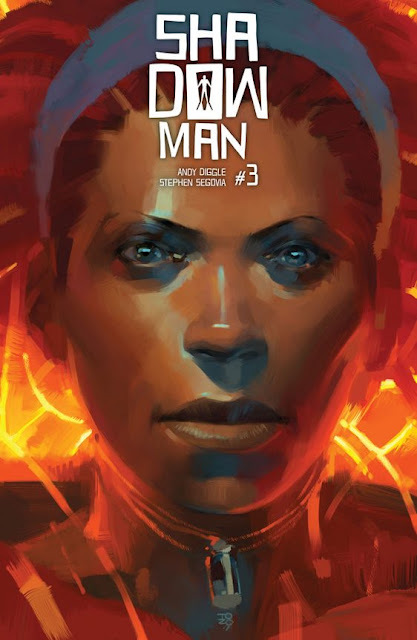 Shadowman is thrust back into the Deadside where he was trapped before but this time he's out to reclaim the weapon that could help him defeat the evil voodoo god Baron Samedi. I consider Valiant Entertainment the home to the best action-adventure comics in the industry (including the Big Two). 'Shadowman' falls into that category too but adds voodoo magic and otherworldly villains. Jack Boniface aka Shadowman just returned to the land of the living from the Deadside and a fight with one of voodoo loa god Baron Samedi's minions has sent him back. His partner Alyssa Miles, an abettor to the Shadowman host, was still resentful for his disappearance before, having to protect New Orleans from mystical forces on her own and now has to do everything to bring him back. It's own giant mind game taking place in two different dimensions. Andy Diggle is obviously a great writer of action but his ability to convey human behavior with very specific dialogue is what makes this comic both exciting and layered. Alyssa will do whatever she can to save Jack, her sense of duty is unimpeachable, even if her personal feelings about him abandoning her, willfully or not, still bother her. Jack was happy to be back and thought they could continue where they left off but a lot has happened in the time he was gone so it's a lot harder for her to just move on. You can sense that in the congenial way he talks to her, seemingly clueless about her bitterness. She is much terser and matter-of-fact in her speech keeping things on a professional level and thus a distance between them. It's an important detail amid all the action and magic that helps define who these heroes are at the present time leaving me wishing they can reconcile before something terrible happens to one of them. After all, if you don't care for the characters what good is the story? Stephen Segovia (with Adam Pollina) is a master of choreographing these battles between Jack and the Ziwanda along with the roaming undead. His depiction of the Deadside is frightening, bizarre, and sometimes dizzying. There's one page in particular that M. C. Escher would be proud of. The contrast between the real world and Deadside is conveyed in much the way Jack describes as a "twisted reflection of our own world." It's the world George Baily returns to in 'It's A Wonderful Life,' if he had never been born except with a much more sinister supernatural approach. It's made all that much more menacing with dark rich colors from Ulises Arreola (with David Baron) and dynamic lettering from Simon Bowland. 'Shadowman' is the type of great serial storytelling that keeps you glued to the page rooting for the good guys for their safety and for reconciliation. Diggle makes you care about them and that's vital when you're thrust into a dangerous supernatural thriller. This is unlike most comics especially the superhero type because Jack is a reluctant defender against dark forces who sees his powers as much as a curse as a gift. Nonetheless, along with Alyssa, they make a great duo in the face of deadly circumstances. This is another page-turning, rollicking action series from Valiant that you can't miss.